Yes, it's true, I have today received my first review that is less than favourable. This all started because I wanted to offer our gorgeous storytime session in local libraries in my home county of Lancashire. The libraries come under the jurisdiction of the North Lancashire Area Library Manager who told me that having seen my most recent book, (It's Stickinormous!") she would not be working with me, either to book me for library events, or to buy my books. It took me some while to establish with this manager why this should be, and it seems her main reason is because I have published the books myself, so therefore (in her words) "They have not undergone with rigorous editing process" of a mainstream publisher. Neither are they deemed strong enough to withstand regular library use. So, because they will not be buying my books because they are not of a "high enough standard" (quote) neither will they invite me to events as they only wish to invite authors whose works are available in the libraries. Oh yes, and my story sessions are not of a professional standard, so perhaps if I were to go along and see how other authors do it, I might learn something. Now, I have been running storytimes in schools and various other venues for five years. I pride myself on maintaining the highest professional standards and give the kids a great time. The reaction I get from kids, parents and teachers tells me I am doing it absolutely right. I am invited every year to read to children by Kendal's Sunday Library Service - but they are in a different county - Cumbria, and I recently had a great day out with the Blackpool Library Service for World Book Day, again a different authority. So, ever up for a challenge, I asked my county councillor to find out for me how I might tackle this problem and how it might be resolved. The review below is the result. Before you read that though, let me just tell you that whilst I was lining up to take part in Fleetwood carnival last week, the daughter and grandaughter of my county councillor rushed up to me to say how mad keen they were on Frog the Dog, what a thrill it was to meet me and could they buy a Frog Ted from me there and then because the grandaughter was so taken with him. She is nine years old. Here is another adventure with Frog the Dog and his feline friend Ginger Jelly. Together they enjoy sticking shapes and playing snakes and ladders, until Ginger becomes far too sticky. The concept of the book is good; using a dog as the main character has been successful with many picture books, old favourite Harry the Dirty Dog and Hairy MacClary are just two examples. However on this occasion the story does not fulfil the promise of this concept. It is hard to know the age group the book is aimed at, for while the illustrations are very simplistic and lacking in finer detail, the story is over long and drawn out. Small illustrations in the corner of the page, presumably of Obi–Sven-Knobi, the smart grey velvet cat, bear little relation to the story. Careful editing would probably have improved the language in the book. A nice touch is a snakes and ladder game in the back, but the flimsy format of the book makes it more suited to personal, rather than library use. While applauding the author’s attempt to write a story “of friendship, patience and the everyday experience of small but favourite things being important”, these sentiments are not dealt with in sufficient detail to be significant. The idea behind the book is admirable, but sadly this is a story which doesn’t work. I would like to invite any of you who wish to read the story to email me for a text copy - you can see some extract pics on our wagsite. Or buy the book yourself - £4.00 worth of fun and silliness! Perhaps if you have already read it, you would like to express your views? After I had the conversation with the Area Manager I was furious that she should be so dismissive purely on the grounds that I have published these books myself. These books have been carefully edited and scrutinised by teachers, head teachers, and parents. They have been thoroughly tested on children and small furry animals. Now I am trying to be philosophical - realistically the library service would not have brought me in much business, even county wide, but I have always loved libraries, and it feels, despite my trying to be business like, that an old friend has slapped me in the face. Bring on the supermarkets - and heaven save us from literary pretensions and snobbery! How rude. The tone of voice of the feedback is rather patronising, as if you had a bright idea, rushed off to go and do it but forgot to read the instructions. Quite clearly not the case, and probably a case of one person's opinion being given a little too much air time. Unfortunately an example of the world being round, it is necessary though - it's the exception that proves the rule! I think it's interesting that this reviewer quotes the likes of "Dirty Harry" and "Hairy McClary". Both of these are excellent books, but have been around more twenty years. I might have expected Kipper or Spot. It also interests me that no mention has been made whatsoever of the Frog Facts at the beginning of the book. These Frog Facts explain the parts of a book to children, and the correct names for them. Isn't that of some note? Thank you for your comment Natalie, and for your common sense. Such a shame to see so many local children losing out on such great story telling. 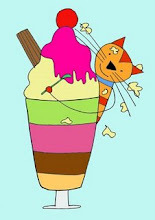 The reception this author has had in other local authority areas indicate the high standard of illustration and writing of the Frog the Dog books. Im guessing the reviewer is some kind of Cruella De Ville Character. This review by the early years advisor is opinion based - there is no constructive feedback given. One might expect there to be comments about vocabulary, sentence structure, appropriateness of language used, as well as an acknowledgement that the simple graphics are accessible to young children and those who are less able. It's very disappointing that the library service in this ares should be so unimaginative! Dunstan, are you suggesting that this woman is going to make fur coats of the Frog Teds??? I am astounded by Lancashire County Council. 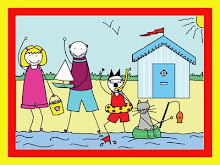 I have 2 autistic children aged 7 and 2 and are constantly looking for just the sort of books as Frog the Dogs Stickinormous. The book itself is bright,colurful and the drawings are great! They are simplistic enough for a child to be able to copy but there are a lot of other details shown in the pictures to capture and expand the imagination. The facial expressions are easy to read unlike maybe a more complex illustration. The way the pictures are encapsulated in a bright border also helps in concentration for a child who is not as confident with reading. The Frog facts are such a good idea and give the child a sense of enpowerment, knowing something an adult may not know. These facts also helps them in their own story telling. The little pictures of Obi break up a page of just words with a little fun, but are far enough away from the words as not to distract. Now to the story - the story is delightful, full of values often lacking in todays world, patience & sharing are keystones to child development and are brought over in a fun none lecturing way. I also personally as a mum love the fact that tidying up is added to the story, showing responsibility. The story is not long-winded at all it is appropriate for the age group it is written for. If there were other stories adapted for babies that were less detailed & maybe a board book, I would not hesitate to buy them too for my toddler as a first words & story book. 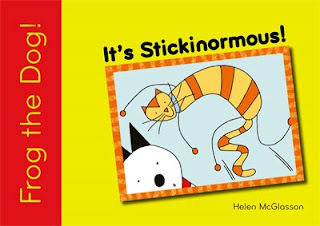 I have bought Stickinormous and would certainly give copies of it as a gift!and fully intend to. Well Done Helen!. This is a genuinely useful review that will be helpful to other potential buyers. you not only explain why you like for your young family, but how it will appeal to others and why. A very considered and thoughtful reponse. Please excuse me whilst I go off to post this review elsewhere on the wagsite! How disappointing that poor review must have been. Keep your chin up, consider her point of view (but in the context of other reviewers), keep solicting other feedback and opportunties and, above all, keep at it! Reviewing isn't a science any more than writing is ... and obviously your readership does not concur with the review! We were just popping by to give you an award! And this is what we find! A story about a bad review! Well, then we do hope our award will cheer you up! See our latest post. Hurrah! Brenda, you are right of course that a sense of perspective is important, and as the first and only review of this sort in five years, we don't have too much to worry about. It hurt the most because this is the culmination of several months work of trying forge a working relationship with the county library service that I had hoped would raise my profile in the county. and that they would rather promote their own reading festivals with authors from other counties than with local talent. i have also got this amazing review from Deborah with the two autistic children. On the back of this, i have approached the National Autism Society who have agreed to review our books. if they feel they are as suitable as Deborah says, they will promote through their society. This is a great opportunity that I am confident will bear fruit. More on this in a blog post, I trust! Roufa and Mimi, an Award??? For me??! Imagine, an award! I havent got so much as a cycling proficiency certificate. Helen, I’ve been thinking about this since I read your posting. I think this is every writer’s nightmare, but it also happens to every writer at least once. There is always someone out there too jealous or thick or full of themselves to appreciate the work. You may be in good company, but that is cold comfort when it is you. Hang in there and keep up your talented work. You are quite right that every writer has a poor review somewhere, alongside the (sometimes infamous) rejection letters. I once read somewhere that it is a good idea to publish the bad reviews alongside the good ones, partly to show some balance, but mostly to let your advocates speak for you. Well, I couldn't have asked for a better response. All the encouragement and support has been a tremendous boost. Well, I'm lost for words! All I can say is that my three year old niece (the fiercest critic around) sits rooted to the spot from start to finish and then asks for it again, so it's certainly not overlong for her, and she loves the story. I suspect this was written either by someone with no children or who read nothing but Spot lift the flap books to her kids. While any publicity is good publicity I feel this is best consigned to the round file. "All I can say is that my three year old niece (the fiercest critic around) sits rooted to the spot from start to finish and then asks for it again,"
That will do for me! Isn´t there an electronic address to complain? I assure you tons of emails about that matter. It´s not fair. I´ve just write about it in my blog. You´ll win! It's a great post, insightful as always, thank you! It's easy to criticise others when you have a safe well paid job youserself, isnt it? I shall keep sending children to request my books, because that will be noted, but am turning my attentions to organisations who are more appreciative, so that one day, Lancashire county Council will ask ME if they can stock my books. You'll have to watch this space to find out what I'll say! Buy Frog's video for your mobile phone! Become a Frog Fan on Facebook - Join our groups to help spread the word and feel the fun! This is me, Helen. The REAL Helen; not me being a cartoon girl/dog/cat/kitten/cactus. I've given myself ten years from now to establish Frog the Dog as a global brand, and things are starting to hot up. From obscurity to delirious oblivion via international recognition – how hard can it be? 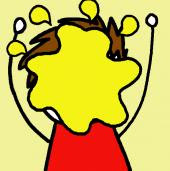 This blog started life as part of our Reading Hero Campaign, and has now metamorphosed into the Sniff and Wag Diaries - or "Why my husband sighs alot". You can still access the RH posts on the main site under RH - top tips. now being served at the Frogblogdoglog.. Welcome to Frog's Beach House! This is a Flickr badge showing items in a set called Frog Chef. Make your own badge here. This is a Flickr badge showing items in a set called Frog's Friends!. Make your own badge here. See Frog pics on Flickr! Blogcatalog - a great place to be seen! Everyone can be a Reading Hero! Read a book at bedtime EVERY day!